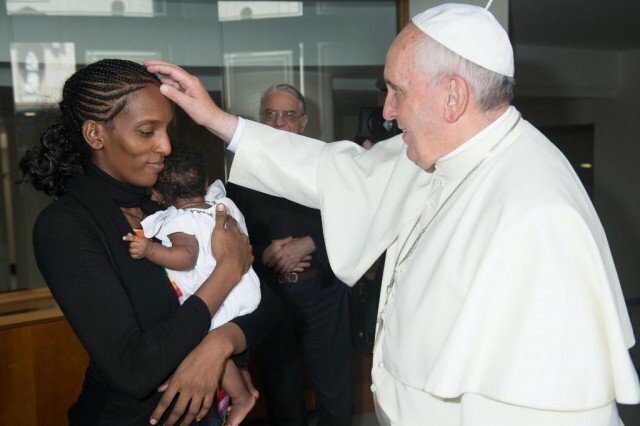 Meriam Yahia Ibrahim Ishag, the Sudanese woman who fled to Italy after being spared a death sentence for renouncing Islam, has met Pope Francis at the Vatican. Meriam Yahia Ibrahim Ishag flew to Rome with her family after more than a month in the US embassy in Khartoum. There was global condemnation when she was sentenced to hang for apostasy by a Sudanese court. Meriam Ibrahim’s father is Muslim so according to Sudan’s version of Islamic law she is also Muslim and cannot convert. She was raised by her Christian mother and says she has never been Muslim. Meriam Ibrahim met Pope Francis at his Santa Marta residence at the Vatican soon after her arrival. “The Pope thanked her for her witness to faith,” Vatican spokesman Father Federico Lombardi was quoted as saying. The meeting, which lasted around half an hour, was intended to show “closeness and solidarity for all those who suffer for their faith,” he added. There was no prior indication of Italy’s involvement in the case. Lapo Pistelli, Italy’s vice-minister for foreign affairs, accompanied Meriam Yahia Ibrahim Ishag on the flight from Khartoum. He posted a photo of himself with Meriam Ibrahim and her children on his Facebook account as they were about to land in Rome.